Cork City PPN – Public Participation Network » Comhar Chathair Chorcai Teo, Cork City Partnership Ltd.
What work will the PPN do? Every local authority in Ireland is required to have a PPN. Our PPN is designed to encourage the city’s many communities to contribute to the making and implementing of decisions and policies which impact upon them and the areas where they live. The PPN is also an important tool for the City Council to keep in touch with communities. So, not only will PPN representatives go to City Hall to have the voices of the network heard, Cork City Council will also call on the PPN to elect persons from its membership when input is required. The network will also work to anticipate policy being developed by the Council and ensure that our members can participate in this process and influence the outcome. Our membership has a wealth of combined knowledge and expertise and the network will do all it can to make sure that this is taken into account by our elected representatives and policy makers. The PPN will also work hard to help member organisations to achieve their objectives. This might mean creating opportunities for peer to peer support and learning, organising training in grant applications, using social media or fundraising or holding themed events to raise public awareness around a certain issue. The great strength of our network lies in our membership. By joining up, you will meet committed people from across the community, volunteer, social inclusion and environmental sectors, learn from them and share your experiences and knowledge. Raise the profile of your work and the work of the community and voluntary, social inclusion and environmental sectors in Cork City! 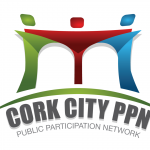 Cork City PPN wants to increase its membership and to hear from as many voices as possible.  Is your group active in Cork City?  Is your group comprised of more than 5 people?  Has your group been in existence for more than 6 months?  Is your group open to new members?  Does your group hold regular meetings-i.e. more than once every two months?  Is your group non-party political and non-sectarian?  Does your group operate on a not-for-profit basis?  Is your group interested in working towards more than a single issue? The network cannot accept membership applications from political parties, businesses, trade unions or any group which denies membership on the basis of gender, family status, religion, sexual orientation, age, race, disability or membership of the traveller community or race. Not sure whether your group is eligible to join? Want to find out more? Want to register straight away?